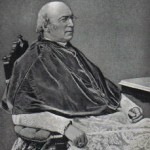 Bishop Richard Gilmour, Bishop of Cleveland from 1872-1891, was the most instrumental voice in working to establish a Catholic university in Cleveland. 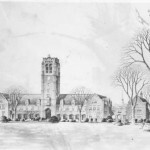 Bishop Gilmour appointed Father Henry Behrens, the Superior of the Buffalo Mission of the Jesuits and rector of Canisius College, to establish a Catholic college in Cleveland. Father Behrens sent Father John B. Neustich to Cleveland under the guise of a visitor to St. Mary’s Parish, when in fact he was to secretly purchase property that would house Cleveland’s first Catholic college. Bishop Gilmour was adamant that absolutely no publicity be done until the school was ready to be opened. The Jesuits complied with his wishes, and included a location on Cleveland’s West Side though they thought the East Side would have more potential. They would not, however, concede on the issue of opening the college as a boarding school. At the time, the school was in an area where businesses, including a large brewery, livery stables, and numerous saloons were situated. They felt this was an inappropriate atmosphere for a boarding school. In August of 1886, Father Behrens arrived in Cleveland to present Fathers Herman Kerckhoff, Joseph Gaechter, and John Devlin to Bishop Gilmour. These three Jesuits along with Father Neustich were the first faculty of St. Ignatius College, named for Ignatius Loyola who founded the Society of Jesus. St. Ignatius College opened its doors on September 6, 1886. One notable name in the first class was Thomas Grasselli, son of Ceasar A. Grasselli, one of Cleveland’s industrial leaders for years. Grasselli Clock Tower and Grasselli Library are both named for this family who generously contributed to the institution. The first class consisted of 76 students, a rather large number considering the secrecy behind the development of the school. The first advertisement for the college was listed in the Catholic Bulletin on August 19, 1886. The tuition for classes in the years 1886-1903 was $40.00 per year. Classes offered included: Grammar, Latin, English, Geography, Arithmetic, Penmanship, Christian Doctrine, Bible History, and German. At the end of the first school year, on June 27, 1887, there was a convocation ceremony with a program, music, and prizes being distributed for good work in the classroom. 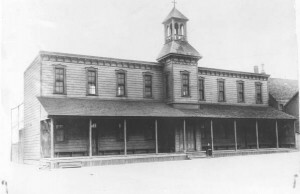 Father Neustich soon realized that the wooden structure which served as the first building of the college was truly inadequate for a real college. 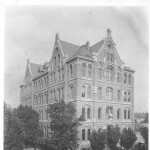 By 1888, he had worked long and hard to see to the construction and opening of the first wing of the new building for the college, which is presently St. Ignatius High School. With the completion of this structure, Father Neustich’s work was done. The college continued its growth, first under the direction of Father Henry Knappmeyer, and then with many other Jesuits to follow the lead of these first two influential and successful Jesuit presidents. In 1890, St. Ignatius College was incorporated under the laws of Ohio and granted the power to confer certificates and degrees. As years passed, new clubs and activities began. The Glee Club, the Orchestra, sports, and Sodalities were eventually formed. The majority of students who completed their studies during the early years of the University joined the diocesan priesthood. In 1925, the first copy of The Carroll News was published. This publication still continues today. In the early 1920s, another great American pastime reached John Carroll with the University joining the collegiate football leagues. Prior to this time, football had only been an intramural or local sport. 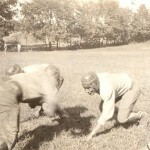 Under Father Bracken, football was soon to become a big center of interest for the college. The 1920s also brought some other significant long-term changes to the University. Negotiations began for an east side site for the University. To go along with this change, on May 15, 1923, St. Ignatius College was renamed Cleveland University for a time. By September of the same year, the name was changed yet again for reasons that have never been completely clear. John Carroll University, named after Bishop John Carroll, the first American Bishop, became the official name. In order to plan for the new location, a building campaign was started under Father Thomas J. Smith. The campaign was continued under Father Benedict Rodman, and 45 acres of property in Idlewood Village (now University Heights) were purchased. Thanks to the business sense of John J. Bernet, general chairman of the building committee and Herman R. Neff, chairman of the preliminary campaign, $1,400,000 in pledges was secured by 1929. Though many Catholics were sought out to donate for this campaign, it should be noted that many wealthy non-Catholics contributed as well as several corporations. The final amount of pledges in 1930 totaled $2,541,382. 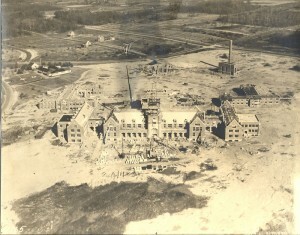 Since financial success was evident, the building of the new campus began by laying the cornerstone on July 5, 1931. Remarks for this event were made by U.S. Senator Robert J. Bulkley and Right Reverend Joseph Schrembs, Bishop of Cleveland. The exteriors of five buildings were completed: administration, physics and biology, chemistry, faculty and students’ residences. Sadly, at this time, the Depression made its way into Cleveland and caused many investors to put their contributions on hold. 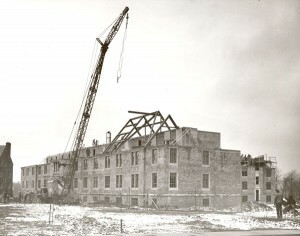 In 1932, construction on the campus was suspended. The Administration building, though not closed off completely, was already housing some rather costly seismology and weather equipment. Father Frederich Odenbach made the choice to move into the tower of the building to watch over the equipment until it could be safely protected when construction some day would continue. 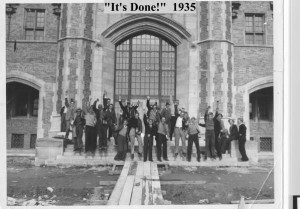 Construction finally resumed in May of 1935. The administration, chemistry, and physics and biology buildings were prepared for classes to begin in the fall. October 7, 1935, saw the 456 students coming to classes on the University Heights campus. The beautiful Grasselli Clock Tower graced the sky, and excitement was evident. By December, the students’ residence hall was ready for occupancy. A new era had begun. Up until this point, the college only admitted men, but the Evening College and Graduate Division in the 1930s admitted women. (In the 1920s female nuns attended Sunday classes.) John Carroll had already given 82 undergraduates degrees to women who attended the summer, evening, and Saturday sessions. 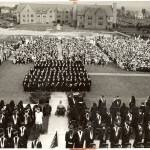 The first female graduates of 1927 were three nuns, and the first laywomen graduated in 1936. In 1943, with the war in full swing, the campus was shut down to students, but opened its doors to the Navy, when its V-12 program was established. This program ran until 1945. In 1945, upon reopening the school after the war, the School of Business, Economics, and Government was established. In 1949, the Evening College was established. At this time a lay advisory board of community leaders was also formed. The look of campus appeared to change constantly for many years. 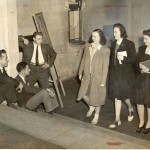 In 1947, a temporary gymnasium was erected on the original chapel foundation. This building also served as the School of Business, and was called the “Pink Barn” due to its brick color which did not quite match the brick on the rest of campus. The Military Science Building (1950), Pacelli Hall (1952), Dolan Hall (1955), the new gymnasium (1957), and the Student Activities Building (1959) were all results of a successful decade. In the late 1950s, under President Hugh Dunn, S.J., a Blueprint Committee was established to project the future needs for John Carroll. This led to the Decade of Progress Development Program which was launched with $19.5 million to expand academic, recreational, and residential facilities. In 1961, Grasselli Library opened its doors. Murphy Hall opened its residence in 1964, with Bohannon Science Building to follow in 1967, thanks to the first million-dollar gift in the university’s history by Cleveland industrialist James Bohannon. At that same time, the Evening College was discontinued and renamed University College. From the late 1950s, support for coeducation seemed to increase, though the debate still continued. Finally, in 1968 the College of Arts and Sciences officially became coeducational. Women were also permitted to become on-campus residents that same year. Murphy Hall became their first residence on campus. Rather quickly, a women’s Glee Club was established and a female became editor of The Carroll News. A dean of women was hired as well as a female athletic director to get intercollegiate sports teams for women going. 1969 saw the completion of a Student Activities Annex which included a student bar known as the “Airport Lounge,” Little Theater, Development and Alumni offices, and Military Science. University governance was reorganized under a new board of trustees, with three-fourths lay people and one-fourth Jesuit membership. The John Carroll University Jesuit Community was separately incorporated. In 1971, the Fritzsche Religious Center opened. The first group of women graduated from the College of Arts and Sciences in 1972. The William H. Johnson Natatorium was built to house the campus swimming pool in 1975. Carrollodge was completed in 1976. In 1978, a new dormitory was built and named North Hall. In 1982, Cleveland businessman Walter Sutowski’s gift of one million dollars brought the American Values Campaign over its goal of $8.4 million. With that gift, North Hall was rededicated as Sutowski Hall. Several rather important Commencement speakers also graced John Carroll’s campus during this decade, including George Herbert Walker Bush, Bob Hope, and Don Shula. In 1984, a $2.1 million grant from the Mellen Foundation of Cleveland endowed a chair in finance in the School of Business. The completion of the Recreation Center Complex in 1985 was a highlight for many students during this decade. This complex includes Schott Atrium, Student Activities Offices, an indoor track, an intramural center, and the Student Union Offices. 1986 marked an amazing accomplishment as the University celebrated its Centennial. Centennial Festival Week was its highlight. In 1987, St. Francis Chapel was completed soon to be followed by East Hall (later named Hamlin Hall), the Bruening Hall addition, the Nathan Dauby Plaza, and the renovation of the School of Business. Schott Hall was also completed allowing additional dining facilities to seat several hundred people. In 1990, New Hall (dedicated on November 13, 1993, as Campion Hall after Edmund Campion, a Jesuit Martyr) was built next to East Hall near the football field. Completion of Schweickert Field (baseball field, spectator stands, press box and storage) and Ralph Vince Fitness Center in 1991 brought new interest to campus. In 1994, the T.P. O’Malley, S.J., Center for Communications and Language Arts was opened and dedicated. This addition onto the Administration Building gave students a nice new space for studying and taking classes. 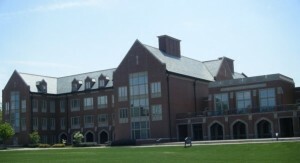 The John G. and Mary Jane Breen Learning Center, an addition to Grasselli Library that doubled its size, was dedicated in 1995. In 1996, the John M. and Mary Jo Boler School of Business was dedicated and the Jesuit residence, Schell House, was completed in 1997. The jewel in the crown of the last decade is the very impressive state-of-the-art Dolan Science Center. Charles and Helen Dolan pledged $20 million toward the center in 2000, ground was broken in 2001, and the center was opened and dedicated in 2003. This structure was the reward of a very successful campaign entitled “Choosing the Greater Good” followed by the “Kresge Challenge.” 2003 also marked the completion and dedication of Don Shula Stadium at Wasmer Field. The campus has continued to grow in past years with the additions of seven apartment buildings around Fairmount Circle, the temple property on Green Road (now called the Green Road Annex), and the purchase of the Fairmount Circle shopping center. The campus has also hosted many prestigious events including the International Children’s Games and the Heartland Delta V Conference. We have also continued to upgrade our campus facilities with renovations to Bernet Hall, Schott Student Dining Hall, Rodman Hall, the Administration Building, the LSC Conference Room, Murphy Room, Jardine Room, and the Corbo Athletic room. In 2009 we chose to honor a true “man for others” by naming our Department of Communication and Theatre Arts after Tim Russert ’72. The NBC/John Carroll University Meet the Press Fellowship was also launched, which awards a prestigious nine-month fellowship to a graduating senior motivated to pursue a career in political journalism. We also began to plan for the future of our academic programs in 2009 and 2010. The Academic Planning Task Force was started and 11 proposals for new academic programs funded by seed money from an anonymous donor were presented. Phase 1 of the task force’s plans was completed in January 2010 and Phase 2 was initiated in Fall 2010. 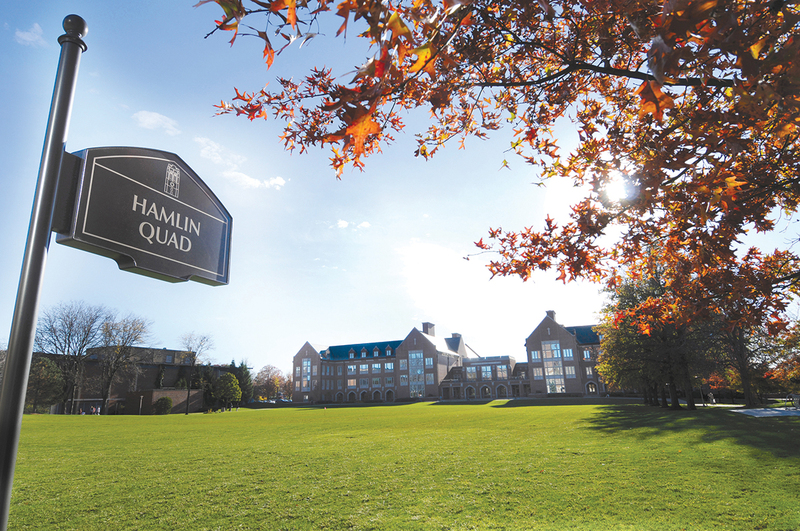 The campus also became a little greener in 2010 with the removal of the temporary parking lot and the restoration of the Hamlin Quad, along with the creation of a Sustainability Committee.